← Attention Seniors! Transfer Google Drive files to a personal account! Many people who are interested in 3D modeling/sculpting have not heard of the free web-based program called SculptGL. SculptGL allows you to use basic sculpting tools and basic coloring tools to make your own 3D creations! This article will go over the basics of SculptGL and about the program itself. Many people, while not familiar with the mechanics of Blender, know what it is. The amount of time needed to create a 3D model/sculpture is a lot, and many people don’t want to spend hundreds of dollars on a sculpting-based program (such as Zbrush or Maya). However, there is a free, alternative program to use that is accessible through your web browser. This program is called SculptGL. and again, an emphasis on the free part of this program. Here we see an example of the basic layout of when you open up SculptGL. It gives you a basic, matte sphere and a basic reference grid. We’ve added a few brushstrokes over the sphere to give you an idea of what it looks like when you use the brush tool. It’s a basic yet helpful tool for you to play around with. You can certainly take some creative liberty with the models in SculptGL. The app allows you to twist and bend the clay how you want. You can change the shader on the clay as well. 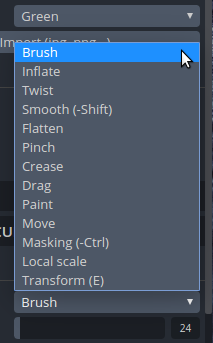 If you want a more shiny finish, go to the RENDERING dropbox and select the tab that says MATCAP. When it gives you the list, select PBR and it’ll give your model a shiny, glistening finish. It gives you the option of a Normal Shader and UV Shader as well. These can give you a different finish on your model and can bring diversity to your different models and creations. The other options under the Rendering tab are to give your model a more in-depth look. [Filmic Tonemap] which creates deeper and more profound shadows for your model. [Matcaps] can change the base color or finish of your model. These are like preset matcaps and colors. [Flat shading] can show you the individual pixels you are working with. [Wireframes] can show you the grid you are working with. You can also change the transparency of your base model. You have other drop boxes as well. Your Topology tab allows you to maneuver between different shapes you have imported. These also allow you to reverse or subdivide a selected layer. If you want to change the resolution of your selected model, you can use the slider in the lower half of the topology menu. In your sculpting and painting drop box, it lets you color your model when going to [sculpting and painting>tools>paint]. SculptGL allows you to use a color gradient and change the transparency, hardness and the metallic finish on the color. This allows you to experiment with different textures and create a more detailed model. When using ScupltGL, It is important to know where your mouse is on the model at all times. Since the model is split by the mirror tool (what you do to one side, it automatically does to the other. This lets you have a perfectly symmetrical model). Make sure you are conscious of brush placement. If not, you risk accidentally editing the wrong portion of your model. To help you understand the menu you will use the most, here is a lost of the tools you can use and what they can help you do. Brush: This tool allows you to inflate the clay as you draw on it. You can benefit by this because it can add layers, creating depth. Inflate: This inflates the area of your brush size into a spherical area. Twist: This twists the clay into a spiral. This can cause severe pixelation, so use carefully. Smooth: This smooths the clay to make a finer finish. This is good if you are adding layer by layer. Flatten: This directly flattens the surface you’re drawing on. Pinch: This brings the surrounding clay into the center of your brush. This can also create severe pixelation. Crease: This also brings in the surrounding clay into a straight line in your brush. Drag/move: This allows you to move the selected parts of your object. This allows you to change the shape of the model. Paint: This lets you access basic colors and paint the object selected. Now that you know what to do, go and try something for yourself! 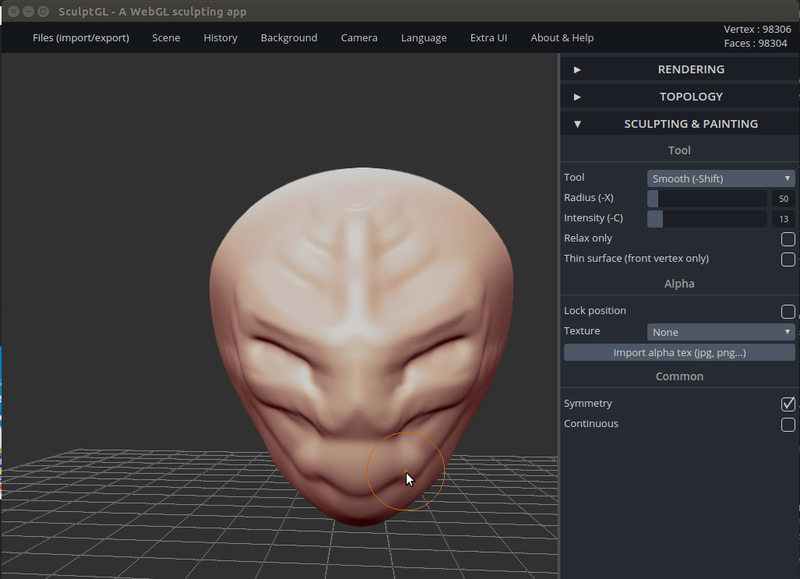 You can download SculptGL in the Chrome App Store for free.